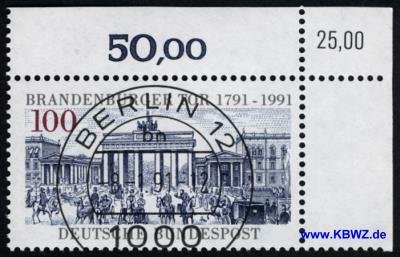 1991, January 8th: "200 Years of Brandenburg Gate"
Top right corner edge with additional corrected value print (KBWZ) “25.00” D-Mark. Stamp in perfect condition with full gum, not folded. Authenticity warranty. Rarely offered! For more information, please visit this offers webpage.